There were two reasons for this. One is that it reflects the circumstances in which Einstein did his early work, including those remarkable papers of 1905. I found out significantly more about his performance at university, for example, as a result of reading this. The other is that it uncovers the way that history - and specifically history of science - can be distorted to get a particular message across. So we get a kind of detective story, uncovering the blatant manipulation of what was (and wasn't) known. That being the case, I have to admit that this book will probably only appeal to readers who are interested in both the history of science and the meta-aspect of how that history of science is undertaken - but this is meat and drink for me and I loved it. Strictly, what we have here is two mini-books, with an essay by Ruth Sime, giving some background on the experiences of women in science in between. 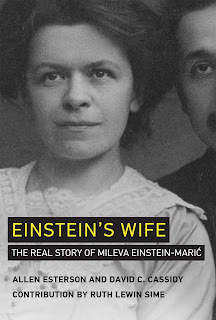 The first, by David Cassidy, gives us the history of science of the education and early work of Albert Einstein and his first wife - the primary subject of the book - Mileva Marić. The second mini-book, by Allen Esterson, takes the step back to explore the way that the history was assembled and influenced by various factions in putting together what he describes as 'The Mileva Story.' The two sections are pretty much independent - in fact Esterson's part could have done with a bit of editorial influence as it repeats rather too much of what comes before. What is fascinating about the 'Mileva Story' is the way that it evolved. Go back to the early years after Einstein's death and his first wife would hardly have featured in a scientific biography outside the social life aspect of Einstein's story. They met doing the same course at university - against the huge odds facing a woman at the time, Marić managed to get a degree and do the work for a doctorate in physics - but the assumption seems to have been back then that there was no interaction between them on Einstein's work. Then came the revolution. In the 1990s, in part due to the discovery of a collection of previously unknown letters, the picture changed radically. It was suggested that Marić was far more than a girlfriend and then wife to the great man. Instead, the narrative became that she actively collaborated on Einstein's work up to and including the special theory of relativity in 1905. This was particularly obvious, it was said, because Einstein was not very good at maths, but Marić was a mathematical genius and did the maths work for him. What this book does is tears apart the sources that this opinion - still held by some - was based on and replaces the myth with a well-researched history. Firstly, there is no basis for the mathematics suggestion. Rather than base his findings on gossip, Esterson shows that Einstein's mathematics results at university were consistently and significantly better than Marić's - and anyway the whole concept is spurious. While it's true that Einstein struggled with aspects of the maths of general relativity (long after any possible input from Marić), the mathematics required for the special theory is no more than undergraduate level. Secondly, there is no evidence of Marić contributing to Einstein's theories. Most of the discussion of physics between them comes when they were doing related theses, when they definitely did bounce ideas off each other. But there is no evidence of Marić providing input to, for example, the great papers of 1905. This last aspect includes a clear example of distorting the facts in the way a name appeared on a couple of the papers and in the way that Einstein's divorce settlement included the prize money from his Nobel award. Why should such a distortion of history of science have happened? It's likely there was an aspect of nationalism - the main source of much of the distortion seems to be a book written by a Serbian author, and Marić was of Serbian ethnicity. It's also possible that there was over-reaction in the very important desire to ensure that women's contribution to science is not underplayed. Historically, a number of important female figures in science have had their work underestimated and it's essential that we give a clear picture of their contribution. However, there is a temptation (Ada Lovelace is an obvious other candidate) to over-emphasise a contribution to make up for past sins - and this doesn't make for good history of science. It also has long been the case that some feel it's necessary to take pot-shots at Einstein, somehow resenting his success. Of course, there is one possibility we have to consider. Esterson and Cassidy are scathing of those who reproduced the 'findings' of the misleading book and papers on Marić. I am, inevitably, taking it on trust here that what is found in Einstein's Wife is accurate. But I think this fair, given the weight of evidence they provide - where most of the opinions they are dismembering are based on hearsay or even seem to be made up from nothing. For me, then, a truly engaging and important story that clarifies a confused aspect of a crucial part of the history of science.